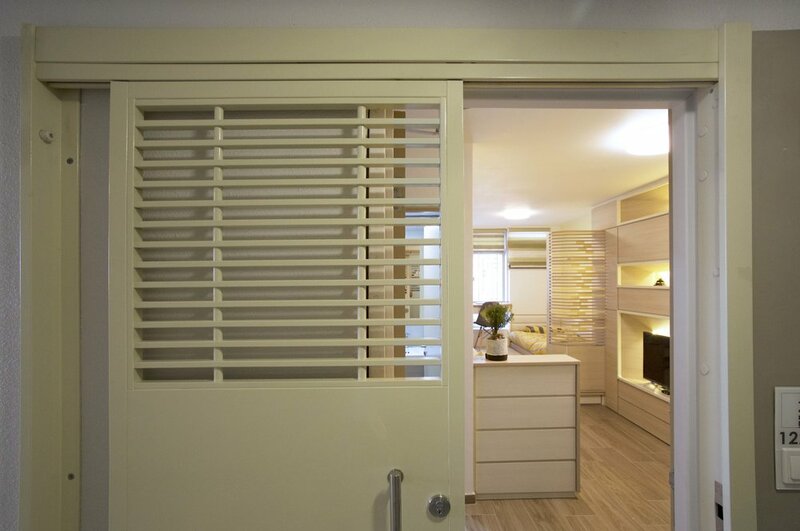 Sim-Plex has refurbished a 324 square feet public housing unit in hong kong, using custom cabinetry to create a three people-living open plan home and with crystalized display space for artwork collection. The client, who is a ceramic and sculptural artwork lover, asked for a fluid spatial arrangement with numerous bright display space to showcase his mini artwork collections.
" In our conversation with the client, he is keen on bringing friends to his apartment to show off his artwork, this inspired us in our design concept: a gallery within a tiny apartment." explained Sim-Plex Design Studio. The studio introduced a cabinetry feature wall with variety of cave-in crystallised slots to act as a backdrop for specific sculptural interventions. The inclined surface and back-lit light trough with yellow backdrop highlight the artworks and lighten up the living room. Previously, the apartment has been an one bedroom unit which suits for only two people living only. The bedroom is fully enclosed with internal wall, leaving a cramped and dark living space. 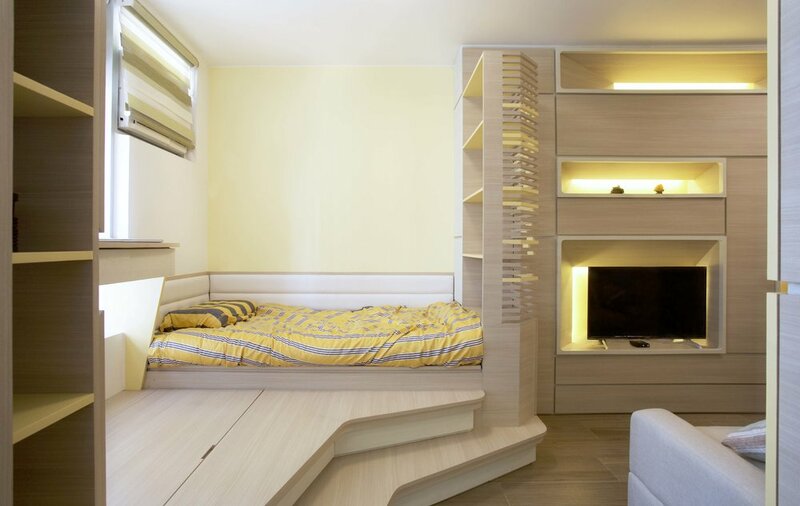 The micro apartment is no strangers to Hong Kong, where space is premium. The creation of smaller and smaller units became trendy but the daily needs are continuously increasing. Piano, raised floor, tremendous storage space, are requested by the client in this project. Adjustable table, concealed storage, sliding door and louver screen repartitioning the compact home into a flexible living space. The 324 gallery is an example of how small residential unit could be used efficiently and multi-functionally. Through integrating the concept of gallery, Sim-Plex created a unique, playful sense of space that suit not only to living, but also as an artwork showroom.